Everyone has heard one of those songs that is good up until a point, and then an annoying outro plays. Wouldn’t it be nice to just skip that bad part of the song automatically? Well you can using iTunes, just set it once and you’ll be able to prevent the outro of a song from ever playing again. Now anytime you play the song, the song will end at the time you specified, skipping the outro. 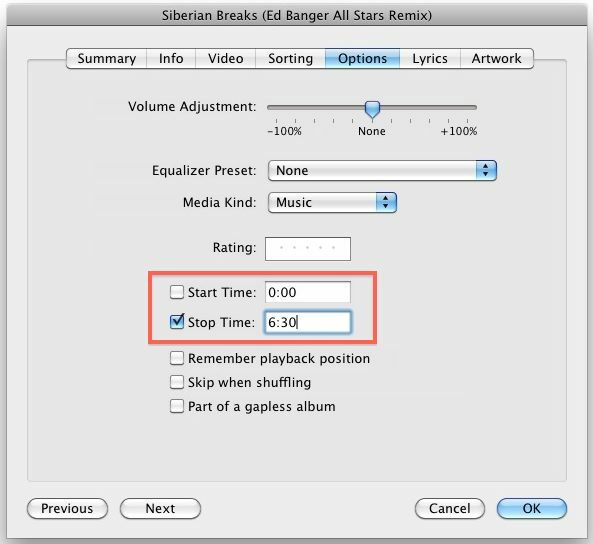 This does not permanently alter the song, it just stops the audio from playing beyond that point in iTunes only. You can get the outro back by unchecking the ‘Stop Time’ box. You can use a similar trick to skip the intro of a song too. HAHA the song example you use here is perfect, no wonder you skipped the last part. why ed banger made a great remix with 4 minutes of nothing but chaotic noise at the end of it is a mystery to me.